History: I grew up in Darwin, finished school, then moved to Perth and completed a 4 year apprenticeship in cooking. I travelled around Australia working in Sydney and Darwin in 5 star Hotels, then moved to the UK working at various Michelin star and rosette hotels and restaurants (Lygon Arms, Holbeck Ghyll Country house Hotel, Amaryllis restaurant at One Devonshire Gardens hotel). Returned to Perth and moved down to Busselton where I worked at Driftwood Estate winery. 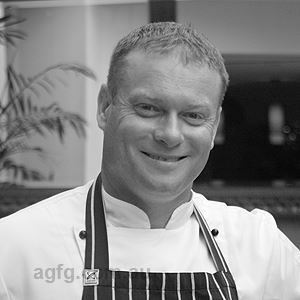 I moved back to Perth and was chef de cuisine of Origins restaurant at the Sheraton Perth Hotel, where I was promoted to Executive Sous Chef and then to Executive Chef before moving to the Richardson Hotel and Spa. I enjoyed cooking from an early age as my grandfather was a pastry cook. Yuzu (a citrus fruit and plant originating in East Asia). All the great chefs from the 90’s. Very creative, the pressure of service, high level of job satisfaction. Blackwood Valley Saddle of Lamb, Wild Mushroom Pancakes, Fondant Potatoes, Shallot Puree.